Black Ice Software - Tiff Viewer version 11.50 is released! Tiff Viewer version 11.50 is released! Stability improvement for opening Microsoft and Adobe 32 bit BMP images and for registering the TIFF Viewer with specific virtual network interfaces! Black Ice Software has released version 11.50 of the Tiff Viewer. This version includes stability improvements for opening Microsoft and Adobe 32 bit BMP images. 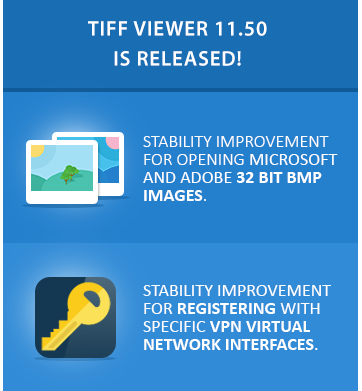 The latest release of TIFF Viewer version 11.50 also includes stability improvements for registering the TIFF Viewer with specific VPN virtual network interfaces. The new stability improvements for the licensing resolves the Error code 35 occurrences when using "Juniper Network Connect Virtual Adapter". Version 11.50 of the TIFF Viewer includes further stability improvements for scanning and improved compatibility for Twain 1.9 or older Data Source Manager. The latest Tiff Viewer also includes stability improvements for the Thumbnail Browser, and updated documentation to enhance user's experience.